At SecoTherm we know that damp is not always easy to spot. In some cases it can appear quickly and in others it can appear gradually. When you do become aware of damp in your property it is important that you quickly identify the damp so that you can find out how to stop it from spreading and causing damage to your property. It is also important that you know how to prevent damp from returning once removed. Caused by humid air coming into contact with cold surfaces, condensation is common in homes. It is characterised by moisture forming on surfaces such as walls and windows, in developed cases, you may notice black stains forming on surfaces – this is the beginning of mould. Although less common, rising damp is a serious problem. When you notice signs of rising damp it is vital that you know how to remove the damp and how to prevent its return. Rising damp occurs when ground water is absorbed into the ground and walls of a structure. Signs of rising damp include plaster and paint deterioration, peeling wallpaper, salts and stains appearing on the walls and a “musty” odour. Condensation is preventable by improving ventilation, heating and insulation in your property. At SecoTherm we advise that you try to keep room temperatures above 15°c to reduce condensation. For more information on how to prevent damp in your property contact us. If you have rising damp SecoTherm can help with our long-lasting SecoMUR injection damp proof course. SecoMUR is engineered with nano microFORMULA technology which produces an active horizontal barrier that guarantees to protect your property from being contaminated by groundwater. 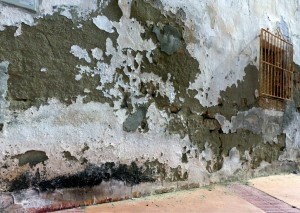 For more information on how SecoMUR can stop rising damp, click here. Red Rose Paint Supplies Ltd.